Last night was one of those nights that remind me that my son, Chikoo, is ageing. It was one of those nights that give me an uneasy feeling in the pit of my stomach and leave me frightened, dreading everyday as it passes by. I was fast asleep, when I heard a feeble whining. At first, I could not make out what was happening as I was in deep sleep. But, as I slowly started coming to my senses, I realised that it was Chikoo, who was whining, whimpering, as if in great pain. I groped in the dark and found him, his face near my feet. I patted him and asked him what was troubling him. I knew I would get no answer — the kind I wanted. I would only hear more whimpering. I tried feeding him water, which he wouldn’t take. Then, I tried massaging his legs, patted his back, scratched behind his ears and slowly he began to quieten. 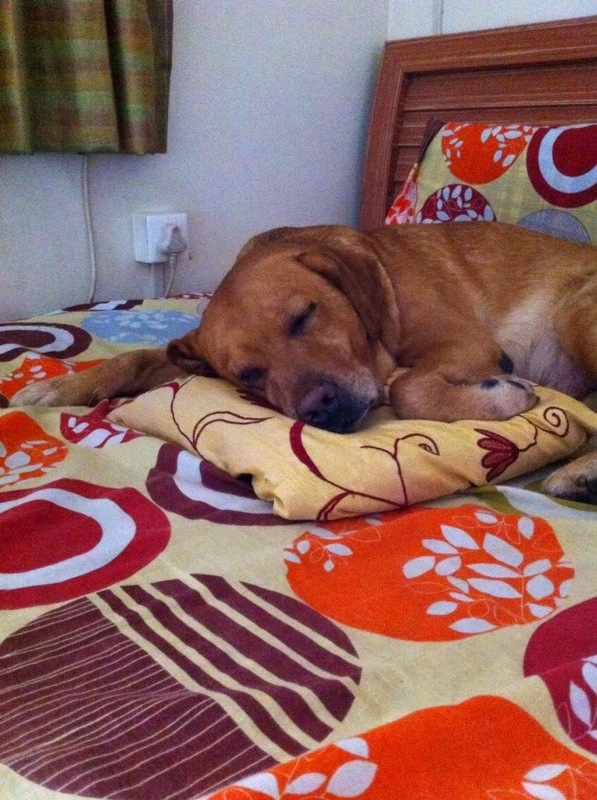 Chikoo suffers from arthritis, which leaves him in pain and exhausted. Every time I sit beside him, he gives me his paw. When I massage it, he feels a relief that is obvious from the calmness I see in his eyes. I don’t have ‘kids’ of my own, but I know how parents feel when their child falls sick. I have heard that no pain can ever equal labour pains. But, the pain, the helplessness one feels when the apple of one’s eyes suffers, that can be the worst pain, ever. Being a pet parent, I suffer a bit more as, my baby can not explain exactly what it is that troubles him. And, as the days pass, my heartbeat quickens. I get scared. Very scared, for my baby. He is not the only one who suffers from separation anxiety! 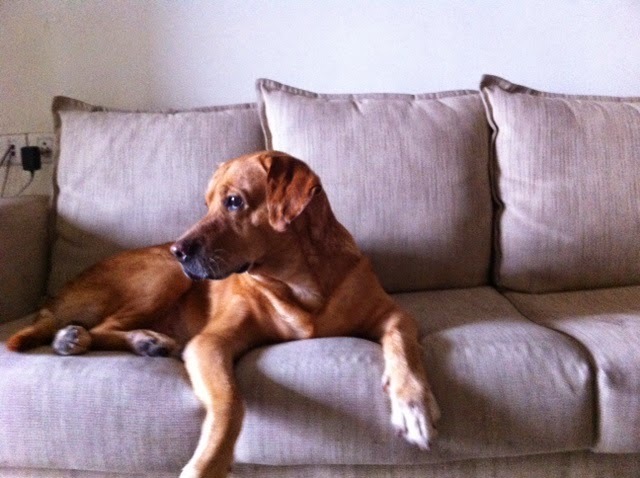 I have heard from my friend how pets suffer during their old age, during their last days. She has been through it. Every time she merely thinks about the dog who was with her during her last days, her eyes moisten. The old dog’s original ‘parents’ felt it below their dignity to have an old, sick dog in their house. Therefore, my friend’s husband got the dog home, to give her the love and care she deserved. She was with my friend for a mere 4 months, but, the bond she developed with her while caring for her! She suffered immensely at the old dog’s demise. She felt an emptiness within her after the dog left her for the heavenly abode. Not every one understands the love that one has for one’s pet. And, it is wholly because of the dog and his unconditional love, that such a bond exists between the two. I often wonder, that when God created the dog, and blessed him with the power to offer love with such an intensity, why did he have to give it such a short life span? Every minute of my day, every breath I take, has Chikoo at its core. And, as the moments fly by, I get an intense urge to stop time in its tracks. I will have that much more time with my darling son. That much more time to pat him, cuddle him, scratch behind his ears and tell him how much I love him. But, as I extend my fingers to grab time, it slips from between them, like the sand. And, my heart misses a beat, too many. A few years ago, when Facebook was the flavour of the season, everyone around me used to be excited about being seen and heard on it. Chatting on FB was more in fashion than chatting in person. And, I would get asked if I was ‘there’ yet. I would sheepishly nod my head and say that I was not at all computer savvy, and therefore not in any such ‘book’. The common reaction used to be shock and surprise, tinged with ridicule. “You are not on Facebook, YET?! Come on! What is so difficult to comprehend?” they would snigger. The jibes piled up high. Finally, I decided to hop onto the internet bandwagon and join the circus. With some help from my brother, I got on to Facebook. But, that is nothing great, one might feel. True. Technical lingo like upload, download, http, cut-copy-paste (the procedure), and most of the other things confused me so much! Some still do. Slowly and steadily, I began to get the hang of it. Whenever I managed to do something new on my own, I would feel like Aristotle! I would be on top of the world and brag about it to anybody I met. They would look at me with “Finally!” writ large on their faces. Many a times, I was ready to give up in exasperation. Had it not been for my dear nephew, my brother and some kind hearted, patient friends, and their priceless assistance, I wouldn’t be here, writing away to glory! While submitting my posts for a blogging challenge, I took the help of an IT professional friend of mine. Well, “took help” is putting it very lightly. I think, I must have pushed him up the wall! I just wouldn’t follow some things that he would explain. I must have given all sorts of names to all the weird ‘thingys’ we see here on the screen. But, the young fellow is blessed with immense patience, as are the others. I sure must have chewed his brains, for, he declared outright that in any other challenges I ever take part, he is NOT going to provide any IT assistance! I can very well understand why he said so. My brother said the same thing. Every time I stumbled, I would call him up, asking him to get me out of the mess. His reply would always be,”Madam, our consultancy firm will be pleased to help you, provided you make the payments for earlier assistance that we offered” ! A similar reaction would come from the IT guy, as well! Poor guys, must have been at their wits’ end! Anyway, I am getting the hang of it. Finally. I have begun using the computer as a ‘toy’ in the hands of me, the master. I very much believe in slow and steady winning the race. I may not win this race, but I will make it to the finishing line, for sure. By hook or by crook! Yesterday, during my walk with Chikoo, I met a pet grandparent walking his little guy, Tuffy. Chikoo and Tuffy met recently and are trying to get to know each other. So, as we were walking, Tuffy’s grandpa began asking things, like how often I bathe Chikoo, what is the reason behind their excess shedding these days and other such stuff. They being relatively new to the entire experience ( Tuffy is just an year old ), he wanted to know things that parents with experience know better. Our conversation was going on smoothly, when he asked me something that quite disturbed me. He asked me if we ever chain Chikoo, or let him move around freely at home. I was quite taken aback since the question came from a pet parent. Why in the world should we chain him up? I told him we can’t ever think of doing such a thing because it was outright cruel, and that our Chikoo was a very well behaved fellow. Secondly, it is his house, too. He can roam around anywhere he wants. Moreover, tying up dogs makes them aggressive. He said they did not chain Tuffy either. I was relieved to hear that piece of news, for sure. * “Can you tie him up, or lock him up in another room? We are scared. Will he bite?” they say when they come visiting. Well, we sure will do it, if you tie up or lock up your kids when we come visiting at your place. We are scared of your kids. We may not have ‘kids’ of our own, but we do have a fair idea how ‘well-behaved’ some kids can be! And, biting humans is not the motto of a dog’s life, for heaven’s sake! We are here to see that he does not make you uncomfortable in any way, so, just relax. * “I never allow my dog to enter the kitchen or the temple room (where the deities are placed)” said a pet parent I met long time ago. Why in the world do such people bring home pets when they have reservations about the dog’s movements in the house? Why not treat the dog as a member of the family and train him in such a way that he knows his area well enough and keeps to it? And, what is the problem if the pet does visit the temple room? It is God who created the animal, too. So, I am sure God won’t have a problem with the dog coming to ‘visit’ him once in a while, will he? When he was a kid, my Chikoo used to pick up idols of gods from the temple room and take them on a tour of our house. I often found some or other idol enjoying some peace and quiet in a cozy corner Chikoo had left it in! *”My husband has asked me to get rid of the dog before he returns home“, said a neighbour, who had brought home a cute little pup in her husband’s absence. I was so disturbed! The pup, who after staying with this woman, had gotten so used to her and her sons, so attached to them. And, now she wanted to ‘get rid of him’?! Poor baby! How would he be able to survive anywhere without his ‘mum’ and his ‘brothers’? Getting home a pet just because somebody in the neighbourhood has one, or just because the kids fancy one, makes no sense. A pet can change your entire world, your entire schedule and life style. One needs to discuss the issue with the family, be ready to accept the changes that will take place if they really are keen on having a pet. Dogs are ‘pack animals’. They may not be born to the ‘pet parents’, but they feel a kinship with their families for as long as they live. And. to think of getting rid of such loving creatures just because they seem a nuisance, or they have grown old is as good as torturing them to death. Once a dog learns that you are family, he will do everything he can to please you, shower you with his unconditional love and be faithful to you till his last breath. I plead with the people who may be contemplating getting home a pet to please consider the changes that are going to take place in their lives on the arrival of the pet; to treat the pet as a member of their family and give it the respect it deserves; train the pet in the best possible way so that having him around becomes a wonderful experience that will be cherished for the rest of your life. The pet may be an animal, but he has feelings and emotions, which he will express in a different way, showering you with all his love and affection to last you a lifetime. And, if making changes in your life style seems an impediment, then just go, get a stuffed toy! As we reach our 40s, the one question that keeps popping in our head is, “Am I growing old?” We have reached middle age, of course we are bound to get edgy! I mean, who enjoys growing old? Or, being called, “Oldie”? I did find the whole progression rather interesting, though! After celebrating my 40th birthday, I began reflecting on my past, noticing the changes in me, my body and my personality, my attitude towards life, and I began feeling good I was inching towards old age. Although, age is just a number for me, and I take good care of myself and don’t feel a day above 21, it’s not something I can deny, right? I am growing old! So, frankly, I am enjoying growing old! There are some aspects of ageing that get my thumbs up. The maturity, the intuition, the perception that I have gained thanks to the passing years, have helped me become a better human being. Or so, I would like to believe! They have helped me change my perspective, accept people and situations as they are, and view the world and not cringe with discomfort. About the situations I can not change – well, I am learning to live with them. We really don’t have a choice, do we? Life isn’t in our control, nor is people’s behaviour. We may as well learn to live with it all, for, it will soon pass. My old age mantra – “This, too, shall pass!” helps me each time. With age, I have learnt to treasure the people who have come into my life, more than the ‘things’ that I have been accumulating. It is because of age that I know the difference between the two, and the importance that needs to be given to the former, and not the latter. However, the visible aspects of ageing like wrinkles and grey hair, achy joints and a dipping enthusiasm, are things that make me agitated. Oh, and the terrible mood swings, too! There was a time, though, not long ago, when I dreamt of “growing old gracefully”. My friends would nod their heads and look at me with the “we shall see” look. But, the sighting of the first grey on my crowning glory made me run to get it ‘fixed’. ‘Lines’ now mean something that I see more on my face than on the pages of a book! Fine lines and laugh lines keep appearing like apparitions out of the blue! One day they aren’t there, and the next day there are two! Thankfully, there are quick fixes for all these oldie problems! That must make me sound shallow, right? Where’s the wisdom that I gained with age gone? I know, there will be a time not far from today, when I will be all wrinkly and grey. There will be a time, when my joints will creak under my weight and my vision will be blurry; when I will have not sparkling white teeth, but shiny, golden ones! But, that’s life! We keep changing our ‘clothes’ from time to time. But, we also keep gaining so much with every change. And, it is best that we take it all in our stride and keep moving ahead, with our head held high and our spirits, higher! Don’t they say that wine tastes better with age? The same applies to us, humans, too!